What Stacy has taught me: it doesn’t matter how you exit the airplane. Gravity is going to take hold, either way, and pull you directly to your destination. Stacy had already stated that 2018 would be the “Year She Leapt.” Little did she know what she had set in motion. Like a parachute pulled before she was ready to jump, it yanked her right out into the big blue sky. Anticipating a big year myself, I reached out to Stacy in January 2018 after gaining so much encouragement from her messages on Medium and Facebook (intended for women, but her writing still spoke to me). After learning about the similarity of our journeys, I asked Stacy to be my accountability partner. We agreed to virtually “hold hands and leap” from our current positions working for others to investing in our own visions. We started out strong but about a month into 2018, the currents in the stream of life took over, interrupting our grand plans. Our hands loosened their grip and we each drifted back to our separate journeys. When I opened her email a few months later, I was shocked to read that she had been fired from her job. She was a model employee! She had been a self-starter since she started working at 14. Frankly, it didn’t make sense. Stacy didn’t leap; she got pushed! This is the moment when this Wonder Woman showed her power: Stacy decided not to get “another job.” She committed to her vision to grow a mentoring network for women. Almost a year later, she hasn’t looked back. The path that she was meant to take opened up before her. 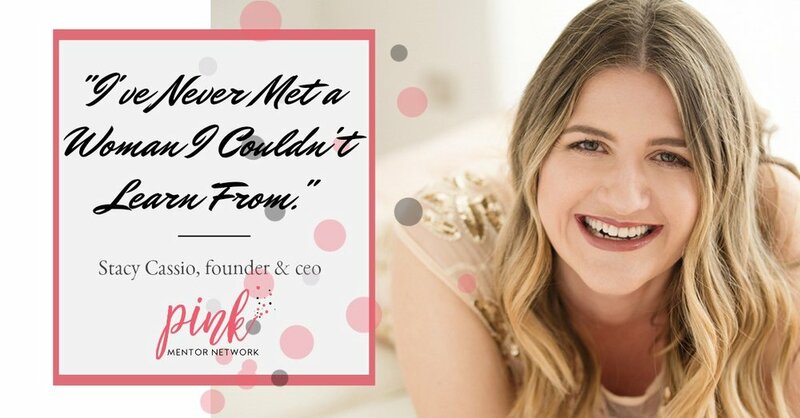 Stacy is now the full-time CEO of Pink Mentor Network. I caught up with Stacy about a month into her new stint as the CEO of her own empire. “When I lost my job, I had this amazing support network.” Stacy had created that network for herself. It was like a future version of Stacy told her to set up Pink Mentor Network, because she was going to need the support. I asked her how she broke out of her small town upbringing in Kansas. Was it when she decided to take a job as a Nanny in New York? For such a self-starting, hard-working woman, the little shove of an outside force has played a big part in Stacy’s story. This is how we met: Stacy’s writing is so beautiful, so clear, such a window to her heart, that I felt like I knew her before we even spoke. We each traveled life journeys that brought us into the alumni network for Seth Godin’s altMBA. In that intensive program, we strengthened the part of ourselves that makes the choice to “ship” our work, to put our ideas out in the world. We learned to overcome the obstacles that keep us from using our voice, to hit the “submit” button on that application, to publish that post, to open our business. Stacy is a powerful example of a Wonder Woman who has embraced her superpowers and chosen to work on developing her less-prominent strengths. As a result, Stacy has created a career that lifts other women up. I have learned so much from her and I’m honored to call her a friend.